Maybe it should be called Sales Season. Want to know how to make sales work for you – and have more cash coming in right now without hurting your year-round profits? There are four important tips, and each one will make a difference to whether your sales bring in a much-welcomed cash boost or tank your margins until the end of time. Today I’m talking about how to have a sale. It’s on my mind because it’s sales season. Black Friday… Cyber Monday… This is the time of year when all retail businesses, marginal ones, finally make a profit. Now everybody knows I’m the “higher prices” guy. You know… Higher prices leads to higher margins, which leads to stronger profits, and gives you more money if you use marketing and sales. It’s a virtuous circle. Stronger demonstrable value always, always is the most profitable strategy over the long haul. But as we know people sometimes need incentives to take action. Time has to be compressed. Sometimes the pressure has to be turned up. Which brings us to The Sale. Sales are not the only way, but they are a good way to get people to take action. Sometimes you just have to stimulate some business, you just need to bring in cash right away. Used strategically, sales are not a bad thing. They ARE a bad thing to rely on for your whole business but strategically they’re not bad. 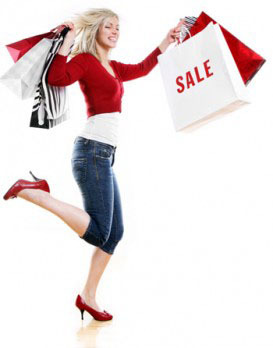 Here are some tips if you’re going to have a sale. First, you can’t always be running a sale. I’m thinking of Banana Republic. I signed up for their buyer’s club account. And they’re always running a sale. Almost every other day I get some sort of a discount coupon from them. It does drive purchases, it does act as an incentive. But it absolutely hurts margins. Next, have to offer a reason for the sale. You don’t want people to expect your sale and you don’t want them to think you’re going to do it all the time. Tell people why you’re making this particular sale. It could be a tax sale, maybe it’s a divorce sale, perhaps it’s an inventory sale. It might be your office burned down – a real fire sale or a flood sale. It could be a “you want to expand your business” sale. It could be “I’m an idiot and I just can’t stop myself and we’re going to have a sale”. You have to offer something as a reason for the sale so that your customers don’t take it for granted that the sale prices are going to be the “new” prices. Next, don’t have the sale at an expected time. In other words, Black Friday – while it does work to put companies in the black – doesn’t work because in fact Black Friday crushes all the sales for all of the time before, and some of the time after. So don’t do your sale when people expect you to have a sale. See, people will compress all their holiday shopping, they’ll compress it to one day. On Saturday right after Black Friday I was in the stores and while they weren’t empty, they really weren’t full. You know what I did on Black Friday? I bought my daughter a new computer. Why did I do it on Black Friday? I got a pretty good discount that I know I was going to get. If people expect your sale, they’re going to wait for it. If it’s the same time every year, they’re going to wait for it. No matter what, don’t always do it at the same time. Next, have a defined, limited amount of time and stick to it. If you say it’s going to be a 3-day sale, it’s a 3-day sale. Prices go back up afterwards. Banana Republic had a Black Friday sale, but – as you expect now that I keep mentioning them – prices stayed at the BF level. Next, make your sales irregular in length. Don’t let people know how long your sales always going to be so that they can wait until the end. Last – It doesn’t always have to be the same kind of deal. You don’t have to cut price. You can cut price but you can also do things like a 2-for-1 or a 3-for-2. You can bundle services with a product or vice-versa. You can throw in the upsells, you can add premium value, you can even offer special things that people can’t get any other time. A limited time offer or a one time offer, in other words you can’t get this any other time so you better buy it now during the sale or promotional period. All of these approaches give your customer more value and your average revenue per transaction where you’d like it to be. Have a reason, a justification. Do it randomly in terms of time. Use other strategies besides cutting price. Good stuff as always, to the point and clearly expressed. May I quote from it, with full attribution and link of course? The Christmas Season is upon on, but we have a much different world out there with on-line taking community small biz out in some cases…. Look at Amazon and Book Stores. All I can say is, get them in your store, no matter what you have to do. And have back office support to compete in your own retail world…. no matter what you have to do to afford it or figure out why it is not working. For God sake, pay everyone their peace of the Pie. As long as the ONLY REASON they’re coming in is for the discounts. If that’s the case, you’re going to have to seriously over-serve them to have them pay full price later. Paul, I am discontinuing my annual Publicity Hound birthday sale as a result of this blog post. Question: Should I let all my ezine subscribers know this so they don’t wait 2 months for a sale that has disappeared? –Did you stand in front of a green screen, or a background of seamless white paper? Hi Joan, I wouldn’t tell them I was “discontinuing” anything. Instead, I’d create a new promotion – full price, maybe even higher price (multi-year or something) which has added (perceived) value. If they’re used to hearing about it – you can begin promoting it early. For the record, I’m not against sales per se, and I run them myself occasionally (hint…). I am strongly against generating the bulk of your business with discounts which depress margins and train your market to pay an expected lower price. Years ago I was part of a research business that did more than 1/2 the year’s business in December. We had trained our market to expect deep discounts and the owner couldn’t figure out why he never had the forecast profits. Thanks for clarifying, Paul. Discounts and special sales are only a very small percentage of my total revenue. Can you please answer my questions about your video above? Did you use a greenscreen or a plain white background, which I love? Also, who did your branding on the opening slide? Joan – It was shot green screen and keyed to the white background. I can’t tell you who did the front bumper (opening sequence). It was someone I found on Craigslist, but who subsequently disappeared when I needed edits. That’s great news. I have my green screen all set up but really liked your white background and didn’t want to have to buy white seamless paper and hassle with that. Thanks Paul you gave me some great ideas which will bring in additional cash! Great practical advice and succinctly given, love it! I use “sales” to create a window of opportunity to get new clients into my business. Once they have accepted the offer, I bend over backwards to ensure that they have a wonderful experience through my whole business process. This to me is where the rubber meets the road as so many businesses do not spend time really making sure the client has a great experience. Once they are thrilled with the overall experience, not only do I have a client for life, I have client’s who are then HAPPY to pay FULL PRICE — that is a winning formula! Thanks for the great video – always enjoy your content. How about using a sale to get the customers attention so you have the opportunity to sell them higher margin products. I always spend more on food and goodies when I stop at the cheapest gas station in town. My original intent being only to buy cheap gas. Thanks for your news letters Paul. Great information, but applying it is short fall. Joaquin – thanks for your comment. Not sure what you mean, though. “If people expect your sale, they’re going to wait for it” – so, so, so true. Funny thing is that I was speaking to a retailer the other day who told me Black Friday was one of his biggest days of the year … but the funny thing was that his prices were the same on Black Friday as they are on every other day … it was just that the consumers perceived the deals where better because it was Black Friday. As always, enjoyed your content. Your a champion!..When you coming to Sydney for a beer! David – no Sydney trips planned, but I’ll let you know. another dose of common sense from the smartest guy I know. From one Paul to another, I’m honored sir. How are things post Parmasters? I was looking for help until I seen this video you made and now I can put what you said to work and start making money on line with my internet business.Thanks for making this video and sharing your knowledge. Paul, you always have great advice, thank you for all the free video content you share with your subscibers! I love it Paul especially , as I am about to have a sale. Bernadette – keep me posted on your results!